My mom and I left yesterday to visit relatives who live on the Cheasapeake Bay. Mom says the trip was mostly about me so I could tell you about it today. On the way to the beach, I got to eat lunch at McDonald's and share my mom's McNuggets. I only get "people food" on special occasions. The beach was beautiful this morning. I ran laps, played in the water and rolled on dead bugs. Mom says she's still picking little seashells out of my fur. I had a wonderful nap on the way home, except for a few nightmares dreams about that evil kitten. I subscribed to Better Homes and Gardens when I retired and have really enjoyed it. My subscription is about to expire so I went on line to see what kind of deal I could get on a new subscription. I found a one-year subscription for $6.99 and for an additional $5, I got a subscription for Family Circle for a year. This offer is available through the Better Homes and Gardens website. I can't believe I got all this for $12. Of course, I need to post the usual disclaimer. I don't stand to gain anything from BHG. My daughter recently introduced me to Bee Haven Acres blog which is written by Bev about her beautiful farm in Pennsylvania. Today she posted about Minerva May Honeycut (her master gardener). I think she's Miss Lily's long lost "country cousin". What do you think? 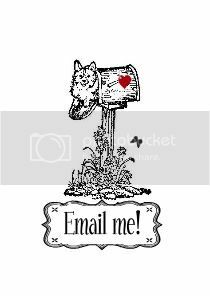 I hope you'll stop by Bee Haven Acres and tell Bev I sent you. 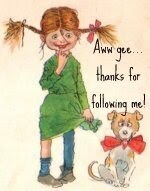 I know you'll enjoy meeting her family and critters! 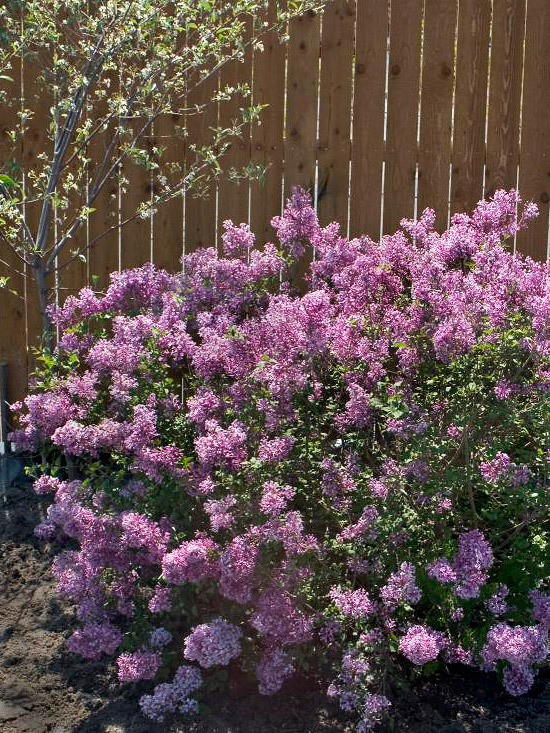 Lilacs are one of my favorites and I thought I'd share this information I read in my new Better Homes and Gardens magazine. I'll be looking for one of these this week! 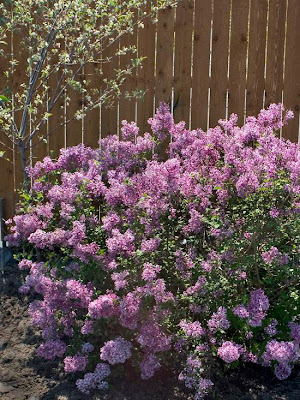 Enjoy lilac's heady fragrance in spring, and again from midsummer into fall with Bloomerang. This compact variety fits neatly in any garden as it grows just 4 to 5 feet tall and wide. It bears a heavy crop of lavender-purple flowers that are perfect for cutting. I also wanted to share this picture I took this week of my friend's cherry tree. It was gorgeous! Today was a busy day at my house. I had to take Hanna to the vet at 7:30 for a dental cleaning. Later I decided it was time to give Heidi a good brushing. Can you believe all that hair? I always leave it in the backyard hoping the birds will gather some of it for their nests. 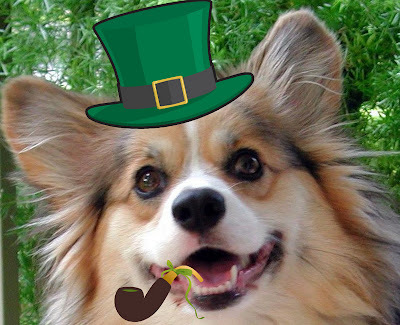 I'd be very excited if I ever found a used nest with corgi hair in it. Miss Heidi's expression makes me think she'd rather be playing with the Frisbee. 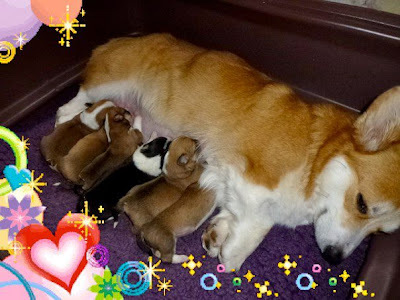 A Facebook friend gave me permission to share this picture of her pretty little Ellie and her new puppies. She has five girls and one boy. What a mega dose of cuteness! The camellias were in full bloom and beautiful. My sister and I decided that I have to find a space in my yard to plant one. Can you believe these are tulips? These gourds are dried and ready to be made into birdhouses. The afternoon was beautiful! The temperature was in the 70's with lots of sunshine and a gentle breeze. As I drove to meet my relatives in the morning, the fog was so thick on the interstate that I could hardly see the car in front of me. We were all so happy when it started to clear just before our tour at 1:00. I hope you've enjoyed my pictures! Happy first day of spring! I celebrated by putting Miss Lily (my garden lady) out in the daffodils. She's wearing my niece's dress and a beautiful little jacket from last year. She wasn't thrilled about wearing the same jacket again but I didn't find another to match her dress. For those of you who are new to my blog, Lily is a flat board lady who gets a new outfit about once a month. I buy her clothes at yard sales and thrift shops and have so much fun making her look beautiful. Hope you've had a wonderful spring day! 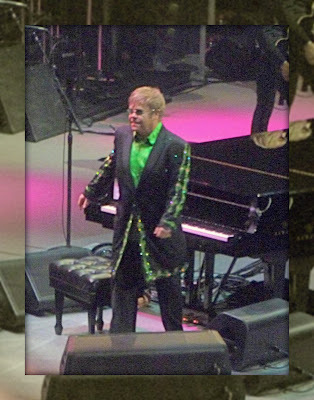 The Elton John concert was fabulous! It's been 15 years or more since I attended a concert and I had forgotten how much fun it is. It made me feel young again! Sir Elton gave it his all! He sang and accompanied himself on the piano for 30 songs and was still full of energy after two and half hours. I read that he is going to be 65 in a couple of weeks. My favorite song was Candle In The Wind. It brought back memories of hearing him singing it with different lyrics at Diana's funeral. Today is going to be a busy one for me. I have some yard work to do this morning and then I'm off to the flea market to find a new spring outfit for Miss Lily (my garden lady). Tonight I'm going to see Elton John in concert. I'm so excited! I'll be sure to share the details tomorrow. What fun things do you have planned for this spring weekend? Now that the weather is warmer, the Saturday flea market that love is back! Last weekend I found some real bargains. This hammered aluminum condiment set was $4. A few weeks ago I shared pictures of some of the pieces I've collected over the years and this pattern matches several of them. I took this picture of a chess set at an estate a few days ago. I love the salt and pepper shaker players. What a clever idea! Last Christmas I made angels out of shakers similar to these so when I look at this picture, I see lots of angels. I didn't buy the game, I just took the picture to share with you. Long before I started my own blog, I read Stone Gable blog almost everyday. 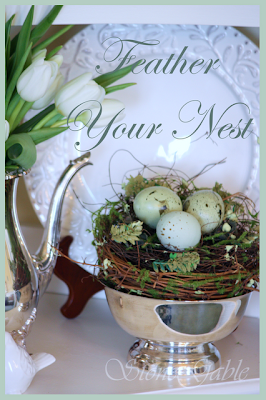 I loved all the wonderful recipes and tutorials that Yvonne shared with her readers. I was sad when she announced back in the fall that she was discontinuing her blog. Well, as of March 5, Stone Gable is back! Check it out when you have a minute. Hope you had a great weekend! I enjoyed working outside. The spring flowers and trees are blooming in my area now. 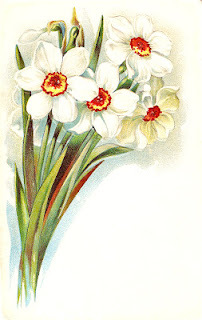 My favorite are the daffodils. I planted at least 20 or 30 new blubs last fall but they aren't coming up. I'm hoping the unusual weather we've had is responsible for their absence. I've read that squirrels will not eat daffodil blubs because they are toxic. I hope that's true! I'll be spending lots of time outside with the corgi girls this week. 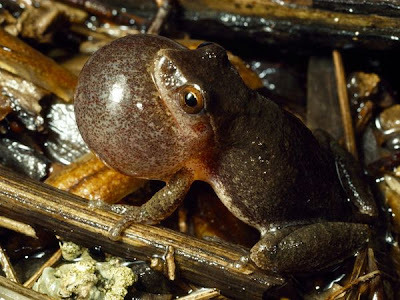 One of my favorite things about early spring is the sound of the spring peepers at night. I found this information on the National Geographic site that you might enjoy. It's hard to believe that these little guys are no bigger than a paper clip! At least 15 years ago I started buying pieces of hammered aluminum thinking it would be more valuable in later years. As far as I can see, that hasn't happened but I still enjoy the pieces I have. This weekend I found a great polish for aluminum and cleaned up some of the pieces in my collection. This butter dish was reproduced by Southern Living Homes a few years ago and distributed at their home parties. I found this napkin holder from the same pattern recently. This is also the same pattern and holds a small casserole dish. The above condiment dish is my favorite! The design has fruit and dogwood flowers. Most hammered aluminum pieces made their way into homes from the 1930s through the 1950s as wedding gifts. Colorful anodized aluminum wares were popular with homemakers through the ‘50s and early ‘60s. - Popular names to look for on collectible hammered aluminum pieces are Arthur Armour, Continental Silver Company, Everlast, Buenilum, Rodney Kent and Pamer-Smith. - The most valuable pieces of hammered aluminum are signed by the maker, and many have elaborate patterns stamped into the metal. Unusual shapes and vessels are also of interest to collectors. This week I added these beautiful girls to my dollhouse. Linda from Wooten's Miniatures in TN made their footed pj's by hand. You would not believe the detail! The buttons are about the size of the head of a straight pin. The feet have bows on them that look like bunny ears. Aren't they adorable playing Chinese checkers with their kitty watching? I love red hair and was so excited when Linda said she would be able to order a redhead girl. ﻿ The patches on their butts are just too cute! She even made them their own blankets!